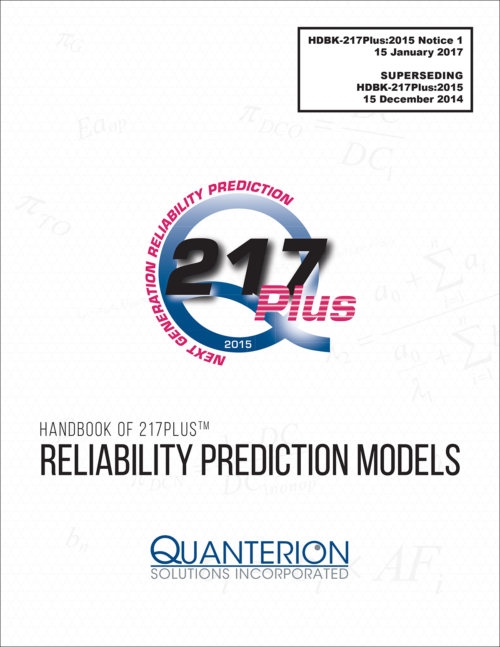 Quanterion Solutions developed Notice 1 to the popular 217Plus™ Handbook of Reliability Prediction Models’ to supersede the 2015 edition developed in 2014. Available exclusively through Quanterion, 217Plus™:2015, Notice 1 replaces the original software reliability prediction model with the Neufelder Model for software reliability prediction contained in IEEE Standard 1633-2016 “IEEE Recommended Practice on Software Reliability”. 217Plus™:2015, Notice 1 is the latest revision to the popular 217Plus™ Handbook of Reliability Prediction Models based on the original MIL-HDBK-217, Reliability Prediction of Electronic Equipment. Available exclusively through Quanterion, 217Plus™:2015, Notice 1 replaces the original software reliability prediction model with the Neufelder Model for software reliability prediction. Quanterion’s long history with electronics prediction models and tools dates back to the development of PRISM®, the System Reliability Assessment methodology and automated reliability prediction tool, developed in the 1990s by Quanterion employees while working at the former Reliability Analysis Center (RAC). After 2000, PRISM® remained in use but was not updated to include new models. In 2005, when the RIAC was recompeted and awarded to a team that included Quanterion, these models were revisited and 217Plus™, an update to PRISM®, was released shortly thereafter. 217Plus™, which doubled the number of models in PRISM® and includes the complete prediction methodology for all of the major component categories in MIL-HDBK-217, was the only DoD-authorized and supported effort to expand the capabilities of PRISM®. Accompanying the updated handbook is an updated 217Plus™:2015, Notice 1 Calculator that facilitates the failure rate calculations of up to ten (10) hardware assemblies, and fifteen (15) software assemblies, based on the component and system reliability models defined by Quanterion’s 217Plus™:2015, Notice 1 methodology. All models are detailed in the 2015, Notice 1 “Handbook of 217Plus Reliability Prediction Models” (HDBK-217Plus™:2015, Notice 1), available exclusively from Quanterion. As an upgrade of the original 217Plus methodology from 2006, 217Plus™:2015, Notice 1 contains all of the 2015 component models, and replaces the original software reliability prediction model with the Neufelder Model for software reliability prediction. It is recommended that the user obtain a copy of the new 217Plus™:2015, Notice 1 Handbook for detailed information on these models, the model development background, and associated reference tables and equations. To take full advantage of the Neufelder Model within 217Plus™:2015, Notice 1, you will need to purchase a copy of IEEE Standard 1633-2016 “IEEE Recommended Practice on Software Reliability” from IEEE or an authorized distributor (Quanterion does not sell IEEE Standard 1633-2016). Quanterion also provides product support to all registered users of the original 217Plus™ or 217Plus™:2015 Calculators. Quanterion also offers an online training video to familiarize reliability practitioners with the original RIAC 217Plus™ electronics reliability prediction methodology (2006 version). Click on the link above to learn more about this training. PRISM® is a registered trademark of Alion Science and Technology.